The supposedly Syrian NGO White Helmets were established in Turkey, not in Syria. They are largely trained in Turkey and Jordan, not inside Syria. They were established in March 2013 by a British ex-military officer with $300,000 in seed funding from Japan, the U.K. and the U.S. The White Helmets: Who are they, who created them, and what purpose do they serve in Syria? These questions remain largely unanswered by the governments, corporate media and NATO-aligned NGOs, including the UN, that have focused their efforts on regime change in Syria for the last seven years. The White Helmets have achieved an almost cult-like status thanks to a diverse, well-oiled and multilaterally-funded support system. Their pictures adorn the front pages of most corporate media sites whenever Syria is mentioned. 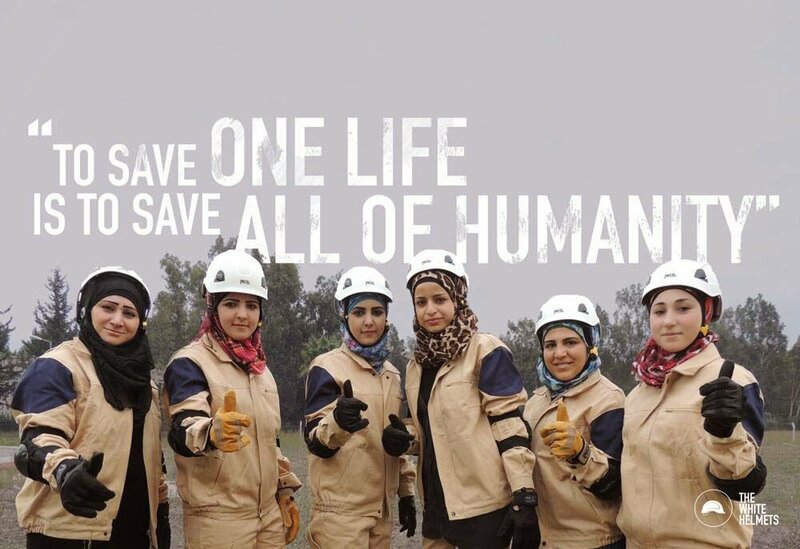 Their unprecedented success can be attributed to a top-drawer PR campaign — one that has been maintained to the highest standards ever since the White Helmets became the public face of “first responders” in Syria following their establishment in March 2013. Such a publicity coup would not have been possible without some heavyweight organizations working behind the scenes to create a brand that would eclipse all others in Western public perception. For the last three years I have been conducting an ongoing investigation into the White Helmets, the much vaunted, so-called Syrian humanitarian NGO that has recently achieved Hollywood fame — winning an Oscar, which was awarded to a Netflix documentary showcasing White Helmet exploits in Syria. This investigation culminated in visits I paid to Syria to expand my enquiries and research on the ground inside the country. I have spent a total of four months in Syria since July 2016, my latest trip having taken place from July to August 2017. In Part One of this series of reports, I will outline the genesis of the White Helmets, as well as their fabrication and evolution into one of the most widely-recognized “humanitarian” organizations the world has ever known. 2: Their motto is “To save one life is to save all humanity;” making them non-sectarian, neutral, and operating without bias. 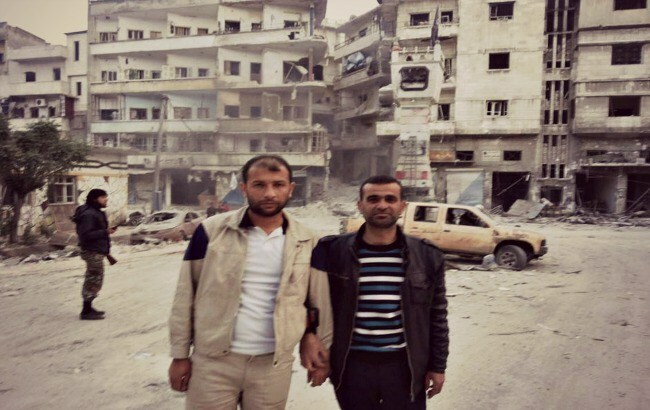 4: They have saved 90,000 lives since they began working in Syria (from the end of 2013 to early 2014). 5: They are Syrian and the impression is given that the White Helmets are the primary, if not the only, U.S.A.R. (Urban Search and Rescue) organization operating inside Syria. My in-depth investigation into the legitimacy of these claims has uncovered some very disturbing anomalies that have never been identified or confronted by the mainstream media in the U.K., EU or U.S., with some very minor exceptions. Those “exceptions” address issues surrounding the White Helmets only in order to flip the narrative back to the “savior” concept and to discredit any criticism of the group as Russian propaganda. Why have these crucial and questionable aspects of the White Helmet construct never been professionally and objectively addressed by the corporate media? A multi-million-dollar-funded organization largely financed by taxpayer money should come under intense scrutiny when the evidence against its bona fides is mounting on a daily basis. I will now relate my findings, but I must emphasize that I am far from being alone in raising the following concerns. Many of my colleagues in independent media, peace activists and genuinely non-governmental NGOs, fostering diplomatic resolution to the Syrian conflict, have conducted their own analyses and arrived at the very same conclusions or raised the same questions. The White Helmets receive funding from the U.K. Foreign Office, curiously through the Conflict, Stability and Security Fund (CSSF)for non-humanitarian aid. According to a statement made by the Foreign and Commonwealth Office, “…the total value of funds committed between June 2013 and the end of the current financial year (31 March 2016) is £19.7m.” At the end of September 2016, U.K. Foreign Secretary Boris Johnson pledged a further £ 32 million. A recent investigation into the U.K. Foreign Office’s Conflict Stability and Security Fund (CSSF) has exposed one unexpected funding stream that has allowed money from that £1 billion U.K. taxpayer-contributory, conflict slush fund to be siphoned into promotional activities for the White Helmets, via U.K. Foreign Office ex-employee and diplomat Carne Ross. During the investigation, I was sent the Independent Diplomat FARA (Foreign Agents Registration Act) submissions, which must be filled out annually for monitoring if an organization receives funds from a foreign government. In the period from 2013 through 2016, Independent Diplomat received £ 3.7 million, the majority of which was from the CSSF. The Conflict, Stability and Security Fund, known as Conflict Pool until April 2015, paid American diplomacy start-up Independent Diplomat $1.4 million in the last 18 months to lobby the U.S. State Department on behalf of the National Coalition of Syrian Revolution and Opposition Forces. In September 2016, Independent Diplomat used a percentage of the funding received to organize a promotional speaking tour — “This is Aleppo, an Inside View of Besieged Syria” — for White Helmets leader Raed Saleh, as well as the Syria Program Manager at Mayday Rescue, Farouq al Habib. Saleh’s deportation from the U.S. for his “extremist connections” is discussed later in this report. Interestingly, the original video of the Mark Toner press briefing has been removed by YouTube. However, another copy of the video can be found here on Vimeo. Raed Saleh is the leader of the White Helmets. Saleh is from Jisr Al Shugour, a town close to the Turkish border, and claims he was originally an electronics salesman. As early as 2011, Jisr Al Shughour was one of the first towns in Idlib to fall to the extremist groups. One of the many terrorist atrocities of this conflict was committed in June 2011 when Syrian Arab Army soldiers and civilians were massacred by the invading militant forces. Later in this report, we examine the reasons behind Saleh’s deportation from the U.S. and his clear links to Nusra Front affiliates inside Syria. A look at various other EU government websites and media reveals that Holland has also funded the White Helmets to the tune of $4.5 million; Germany $4.5 million; Denmark $3.2 million; and Japan an undisclosed sum. The White Helmets also receive equipment and supplies from various EU member states, including France. There is reason to believe that the EU funding of the White Helmets is concealed behind the generic heading of “Emergency Health and Relief Support to the Population Affected by the Crisis in Syria,” through the Directorate-General for European Civil Protection and Humanitarian Aid Operations (DG-ECHO), formerly known as the European Community Humanitarian Aid Office. More recently, Qatar has also confirmed funding of the White Helmets, via its own Fund for Development in collaboration with Qatar Red Crescent. Qatar is known to be funding many of the extremist factions that have been operating inside Syria for the last seven years, including Nusra Front, Ahrar Al Sham, Nour Al Din Zinki, and many of their splinter factions, brutally facilitating the U.S. coalition objectives of destabilizing an independent sovereign nation and bringing about outright regime change – or rather, the establishment of a puppet regime, compliant with U.S. coalition supremacist ambitions in the region. Mayday Rescue was established in the Netherlands in 2014, after the creation of the White Helmets in March 2013. Its primary function appears to be as an intermediary “not for profit,” set up as a conduit to receive and transfer funds to the White Helmets. Mosab Obeidat, mentioned above, was among the early staff members, but all details regarding staff on the Mayday website have since been removed. Mayday “donors” are listed on their website and include the U.K. CSSF, Germany, Netherlands and Denmark. 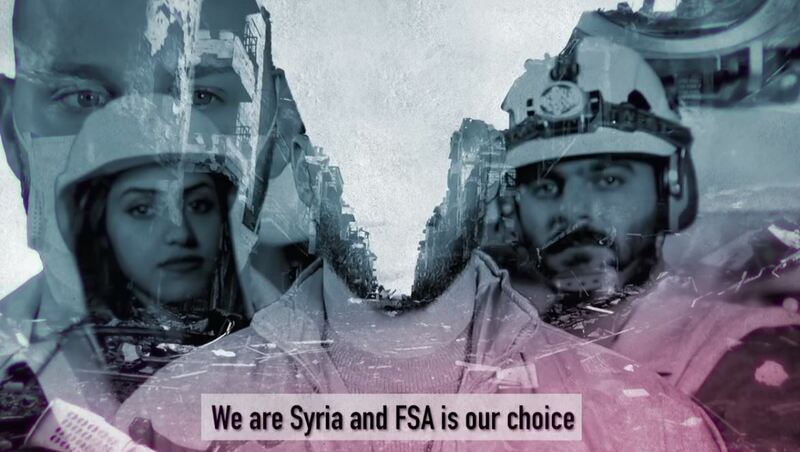 An early video made in collaboration with Hands Off Syria shows the evolution of the White Helmets into the icon they have since become in Western media and among NATO-aligned NGOs. 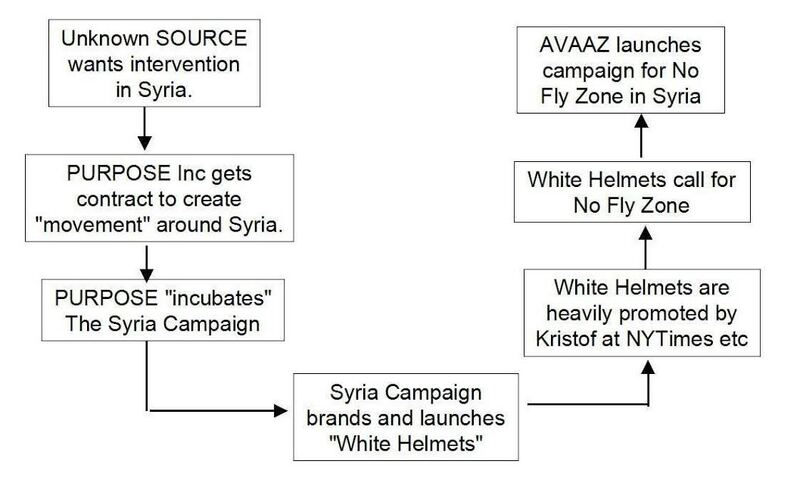 The White Helmets receive considerable public funding, via their “Hero Fund,” orchestrated once more by their tireless PR machine, led by the Syria Campaign. 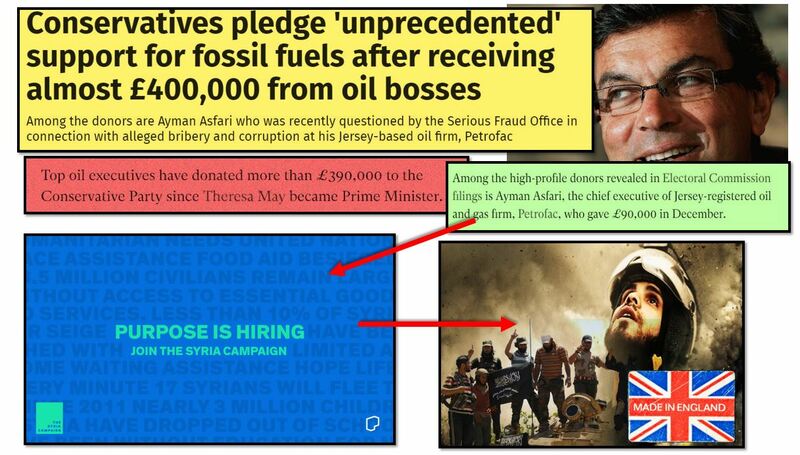 The Syria Campaign, itself, was given seed funding by Petrofac CEO Ayman Asfari. Asfari has his own agenda in Syria, not least his oil interests, as well as connections to the U.K. government. 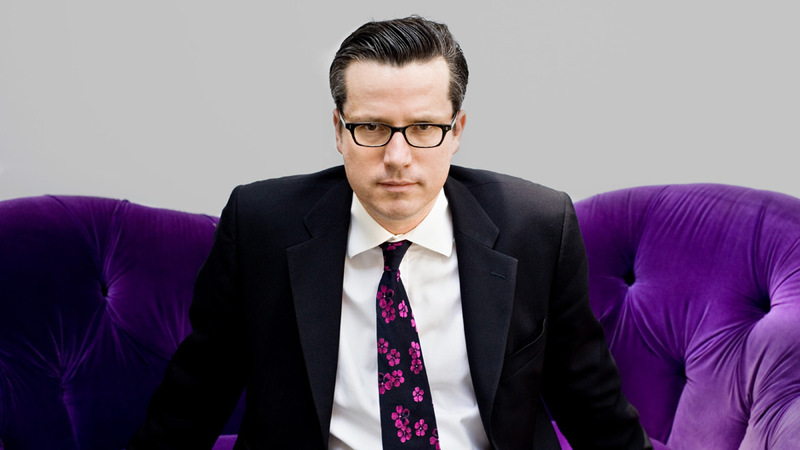 Asfari was also exposed as having donated generously to the Tories under Theresa May. Oil executives, whose industry is promised further government support if the Conservatives are returned to power, have given more than £390,000 to the party since Theresa May became prime minister. They include Ian Taylor, the chief executive of Vitol, whose firm was fined for making payments to an Iraqi state-owned firm, as well as Ayman Asfari, the chief executive of Petrofac, who was recently interviewed by the Serious Fraud Office over suspected corruption. A hideous murder of a rising star in U.K. politics, Jo Cox MP, has just sent shock waves across the world. Within hours of her death, a special fund was established in her name to raise money for three causes. One of those causes is the Syrian White Helmets.” ~ Who Are Syria’s White Helmets? All governments and government-linked entities funding the White Helmets have publicly declared an interest in, or have been working towards, the removal of the internationally recognized Syrian government and its democratically elected President, Bashar Al Assad — thus effecting “regime change” in Syria. This fact alone must surely compromise the proclaimed neutrality of the group. Screenshot from video (below) showing the White Helmets clearly affiliating themselves with the mythical “moderate” FSA (Free Syrian Army) that co-exists with Nusra Front and a variety of extremist groups. 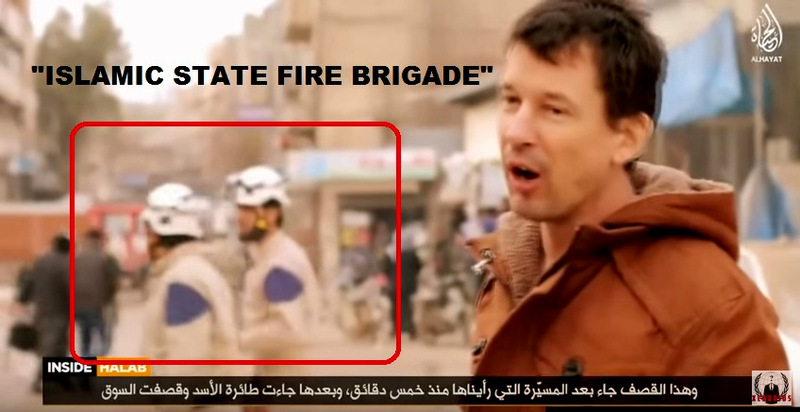 In this promotional video for the CIA- and NATO-funded and armed Free Syrian Army (FSA), an image of one of these “impartial” White Helmet rescuers appears, alongside other Syrian professionals who affiliate themselves with the primarily U.S. coalition-endorsed, -funded and -armed “moderate rebel” FSA. Near universal consensus now accepts that the FSA is an expired myth. 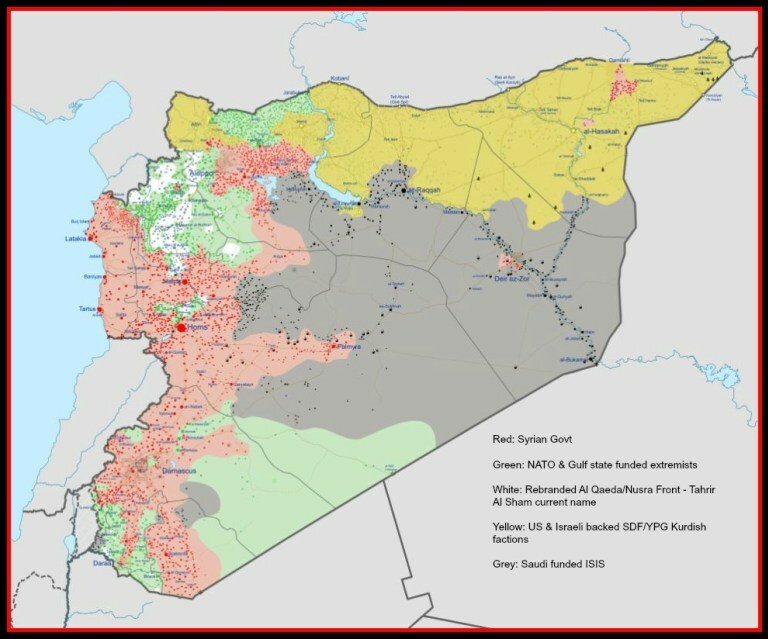 Early on in the U.S. coalition’s fomenting, funding and marketing of the Syrian “uprising,” the FSA was absorbed into the ranks of the better-funded extremist groups, such as the Nusra Front (al-Qaeda in Syria), whose weapons capability far outstripped the lesser FSA armory. 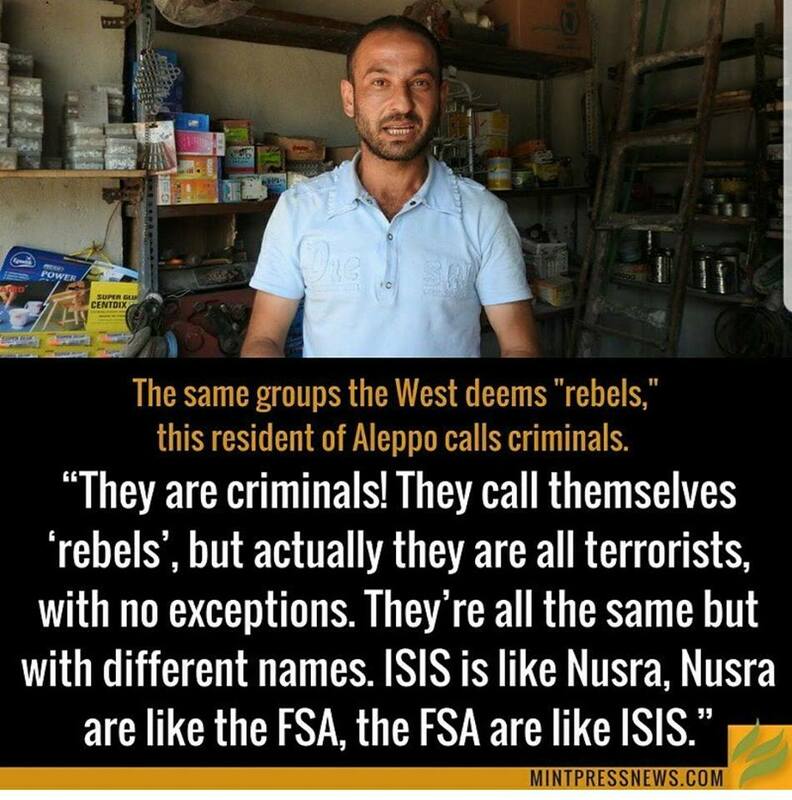 The FSA have become nothing more than a tool of the more powerful Nusra Front, al-Qaeda in Syria. While the U.S. has been a major contributor via its USAID/Chemonics program, it is secondary to the U.K. Foreign Office, which has been the primary source of funding and training for this White Helmet NATO-state construct. Inserted into Syrian society three years after the start of the proxy war that has been waged against a sovereign nation by the U.S.-led coalition for almost seven years, the White Helmets are a thoroughly British affair. The White Helmets were established in Turkey, not in Syria. They are largely trained in Turkey and Jordan, not inside Syria. They were established in March 2013 by a British ex-military officer, James Le Mesurier, with $300,000 in seed funding from Japan, the U.K. and the U.S.
Screenshot from a video of ISIS kidnap victim John Cantile, filmed in Aleppo in 2014 and 2015. The White Helmets are embedded exclusively in areas of Syria occupied by known terrorist organizations, including Nusra Front and ISIS (Daesh), along with so-called “moderate rebels” such as Ahrar al Sham and Nour Al Din Zinki. All these groups and subgroups are responsible for carrying out ethnic cleansing pogroms and documented atrocities against the Syrian people. Nour Al Din Zinki recorded themselves on camera torturing and beheading 12-year-old Palestinian child Abdullah Issa in July 2016. Like the White Helmets, the majority of these armed groups receive funding, training, equipment, weapons and support from the United States and its coalition partners, particularly the Gulf states — a fact that is also extensively documented. 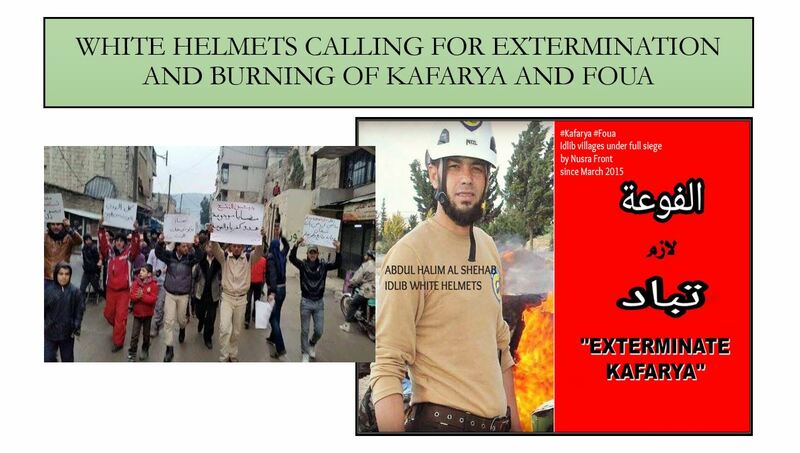 During the situation in Madaya, Syria in January 2016, the White Helmets in Idlib were photographed attending demonstrations and carrying banners that were calling for the “burning and destruction” of the towns of Kafarya and Foua. Kafarya and Foua are two Idlib villages under full siege by Jaish al Fatah (Army of Conquest), which is a coalition of Ahrar Al Sham and Nusra Front. These villages have been under full siege since March 2015. The siege ensures the starvation of villagers, as well as the deprivation of water, medicines and medical treatment. Daily shelling and sniping by Ahrar Al Sham and Nusra Front have killed over 1300 civilians inside the villages so far. If we include civilians who have been killed outside the villages during the evacuations, such as Rashideen, we have lost almost 2000 members of our families and relatives as a result of the terrorist siege and conflict” – Dr Ali Moustafa, head surgeon in Foua. The White Helmets also played a crucial role in supporting Nusra Front during the Rashideen massacre on April 15, 2017. Evacuees from besieged Kafarya and Foua were imprisoned in their buses for two days, with minimal food or water. On the third day, the children were lured from the buses by Nusra Front and White Helmets distributing potato chips. As the children surged towards the food, a blue truck drove into the crowds of children and a bomb inside the truck was detonated, killing and injuring over 300. Infamous ex-White Helmet Muawiya Hassan Agha was present at Rashideen when the massacre was carried out. He is known for his involvement in the execution of two SAA prisoners of war in Khan Touman, Aleppo, Syria, May, 2016. I was in Aleppo one day after this tragedy and was able to speak with survivors and mothers whose children had been abducted and taken to Turkey by White Helmet operatives and Nusra Front terrorists. A total of 114 are still missing, the majority being children. I also returned to Aleppo in July 2017 to interview survivors and families of the missing, who identified Agha as having been at the scene prior to and immediately after the suicide bomb attack. There is video and photographic evidence available that clearly shows the White Helmets participating in Nusra Front operations in areas occupied or taken over by this organization. The video linked above was taken during the Nusra Front’s violent and brutal attack on Idlib in March 2015. In this video, White Helmet operatives are seen clearly beating a Syrian civilian prisoner of Nusra Front and circling the prisoner, mingling with heavily armed and hostile Nusra Front militia. It is worth mentioning that YouTube has made a recent censorship sweep and has removed many of the incriminating videos involving the White Helmets working hand-in-hand with al-Qaeda in Syria — including the video above, which is, mysteriously, no longer available on YouTube. Another video shows the White Helmet operatives, including Muawiya Hassan Agha, celebrating “victory” with Nusra Front in the main square of Idlib. 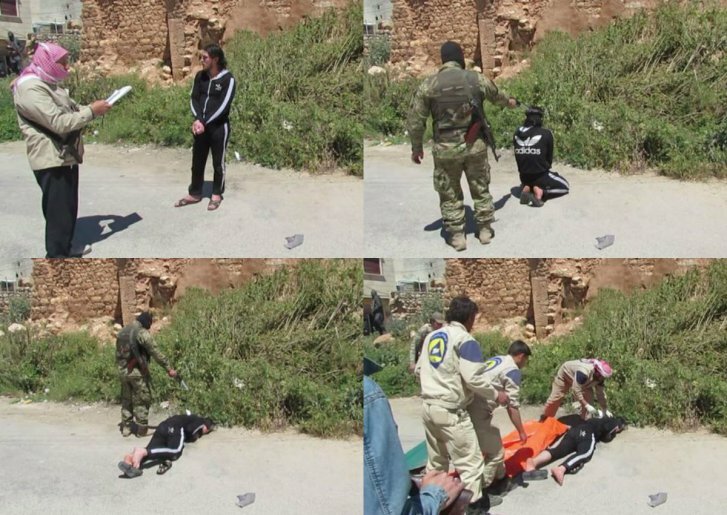 The White Helmets were filmed “cleaning up” after a Nusra Front execution of a civilian prisoner in Haritan, northern Aleppo. Although the official statement from the White Helmets claims they arrived after the execution, the speed with which they appear in the video immediately after the prisoner has been shot in the head demonstrates that they were on the scene and did nothing to prevent it. Curiously, Le Mesurier deems a trial in an extremist Sharia court and extrajudicial execution to be acceptable — an example that has been strongly followed by the White Helmets in their subsequent participation in Sharia court sentencing and execution. Muawiya Hassan Agha takes a selfie with two captured and condemned SAA soldiers who were later publicly tortured and executed. Agha posted related footage to his Facebook page that was later deleted. Various other White Helmet operatives have posted videos of the torture and execution of Syrian Arab Army prisoners to their social media pages with celebratory comments. 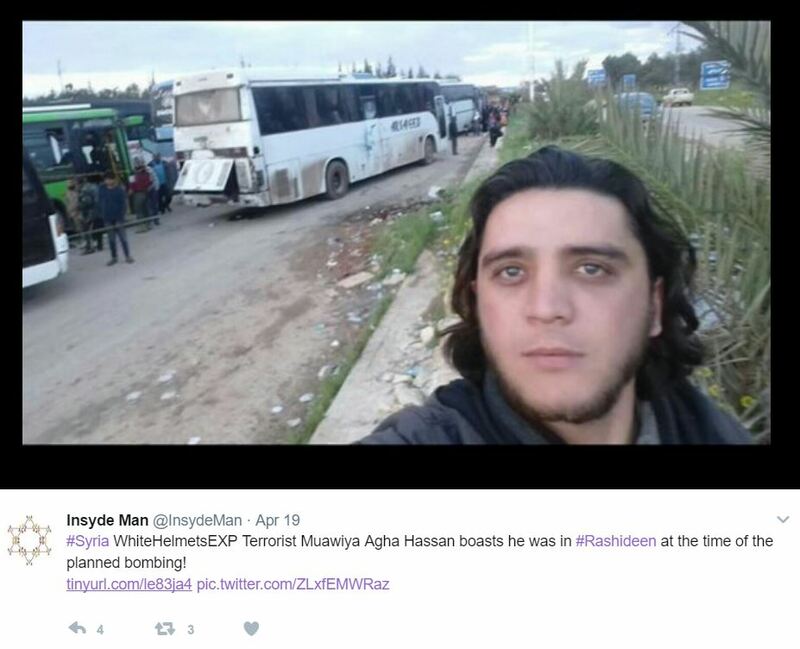 One such operative, Muawiya Hassan Agha, is alleged to have been “sacked” from the White Helmets for his participation in a public execution of two Syrian Arab Army prisoners of war in Khan Touman, south Aleppo in May 2016. It goes without saying that this execution is a clear violation of all ethics surrounding an allegedly “impartial” NGO. However, despite several requests, an official statement has never been issued by the White Helmets. Nor have they publicly condemned the torture and execution of prisoners of war, an act that contravenes the Geneva Convention. 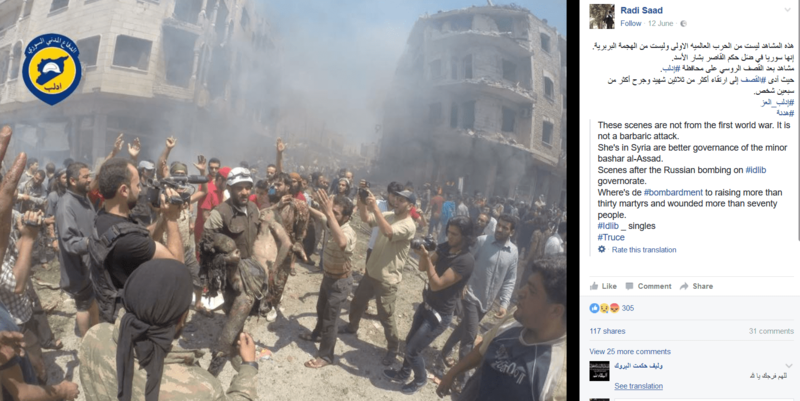 Within three weeks of his alleged sacking, Agha appeared in White Helmet photographs as one of their photographers. Joseph of Arimathea is claimed, in history, to be the disciple who prepared the body of Jesus Christ for burial. This cynical use of blasphemy to cleanse the White Helmets of their multitude of sins backfired royally, as footage of the “saviors of all mankind” cheering a brutal, extremist execution later appeared on social media. This execution took place in the town of Jasim, Dara’a, south of Damascus. The White Helmets are seen not only celebrating the grisly murder but performing their usual mop-up by unceremoniously carting away the body from the scene. Their later claims of giving the body a decent burial and affording the victim some dignity are rendered ridiculous when one views the video below. A video was released that showed a member of the White Helmets’ Dara’a “team” climbing over the slaughtered and dismembered bodies of Syrian Arab Army soldiers piled into the back of a pick-up truck. As the White Helmet operative stands on the mutilated bodies, extremist fighters surrounding the truck, parade a severed head as a war trophy. 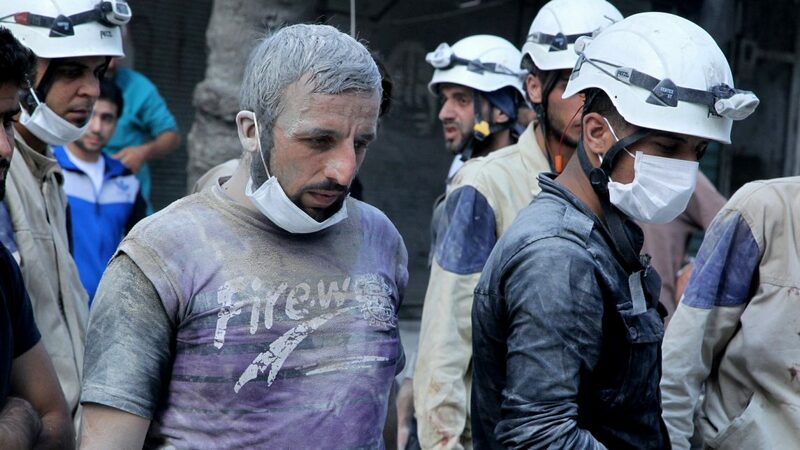 There is no shock or dismay from the ‘heroic’ White Helmet. On the contrary, he is then seen extracting the Syrian flag from among the SAA bodies, before throwing it to the ground. 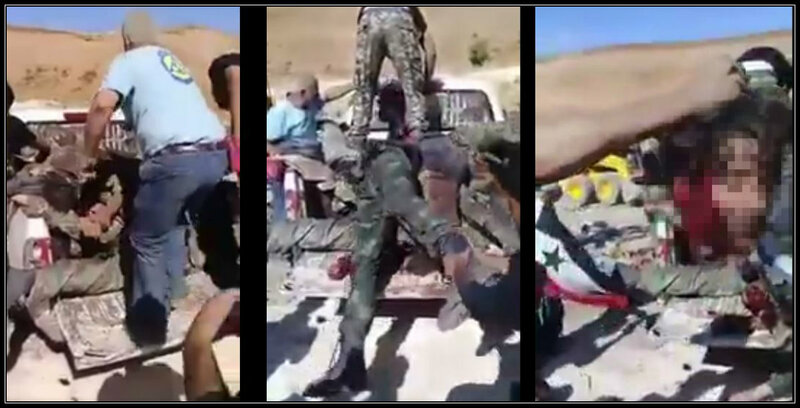 Screenshots of the execution and dismemberment of SAA prisoners of war, with a White Helmets operative in attendance and assisting extremist factions. 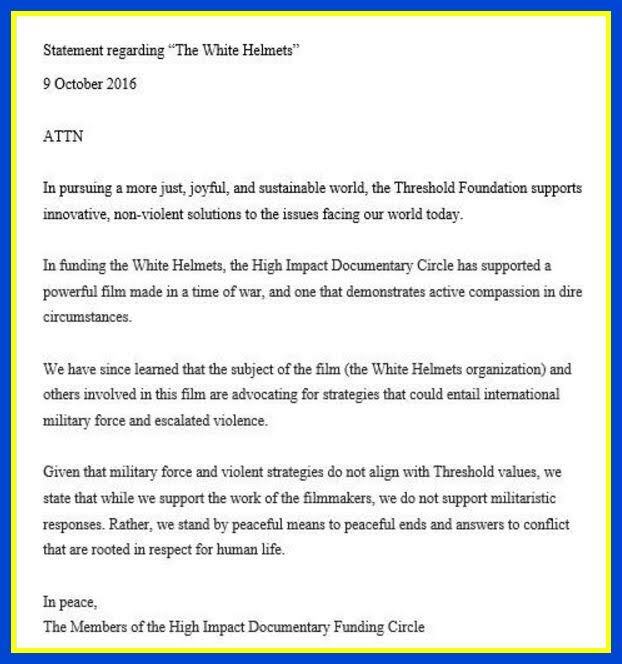 The White Helmets are a publicly-funded organization via their fundraising activities. They also benefit from government funding schemes that depend upon taxpayer contributions. Where is the investigation into an organization whose members frequently ‘breach’ not only the White Helmet “code of conduct” but also contravene every international code of humanitarian law during war? The leader of the White Helmets, Raed Saleh, was deported from Dulles Airport in the U.S. in April 2016. No real explanation was ever given for this decision. Mark Toner of the U.S. State Department fielded questions from media during a press briefing, but did admit to funding the group to the tune of $23 million, as well as suggest that Raed Saleh might have “extremist connections.” Raed Saleh was then allowed back into the U.S. in September 2016 and spoke at the UN Headquarters in New York with the Dutch Mission. Saleh was involved in closed sessions with Syrian activists and former Secretary of State John Kerry, as noted by The New York Times. 1: Yussef has called for the unity of extremist factions such as Nusra Front and Ahrar al Sham. 2: Yussef has clearly professed allegiance and support for Ahrar Al Sham, which was responsible for the massacres in the Alawite village of Al Zaraa in May 2016. 3: Yussef publicly called for the shelling of civilians in Damascus during the 2014 elections. 4: Yussef has advocated the practice of executing civilians during Ramadan if they fail to fast. 5: Yussef endorses the looting of SAA houses after their capture or summary execution. If the head of the Red Cross were to commit such ethical breaches, we would surely be calling for a full investigation. The White Helmets are seemingly given immunity against investigation into their extremist misconduct and violations of the Geneva Convention regarding treatment of prisoners of war. The White Helmets are also erroneously referred to as the “Syria Civil Defence.” However, this name truthfully refers to an organization that has existed in Syria since 1953. I met with the group’s members in Aleppo, Lattakia, Tartous and Damascus during my extensive time in Syria. The REAL Syria Civil Defence (RSCD) were founder members of the ICDO [International Civil Defence organization], which is affiliated with the UN, WHO, OCHA, the Red Cross and Red Crescent. The REAL Syria Civil Defence are still paying subscriptions to the ICDO totaling 20,000 Swiss francs annually. The group operated in both government- and armed militia-held areas until 2016, when it was decided that they should work only in government-held areas due to safety concerns, as armed groups were deliberately targeting their crew members during rescue missions in occupied areas. 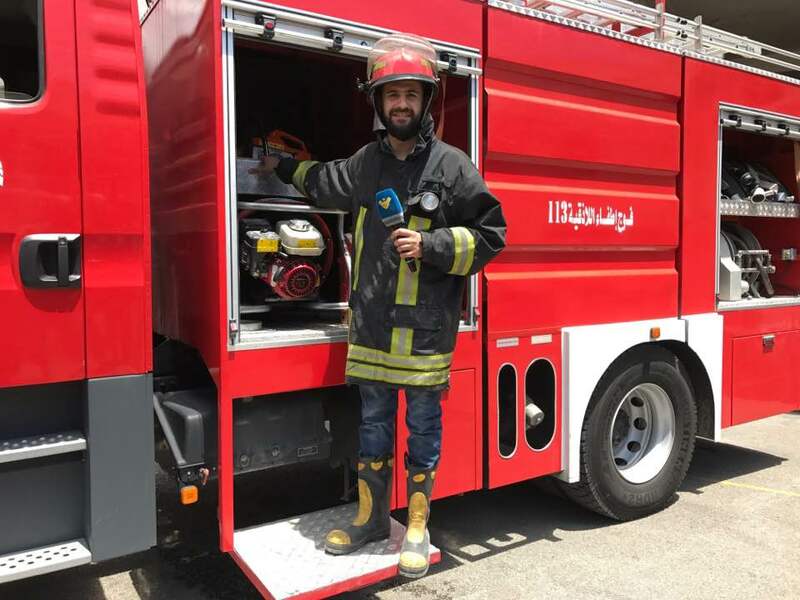 The REAL Syria Civil Defence, while working predominantly in government-held areas, is nevertheless serving 80 percent of the Syrian population, including over six million internally displaced people who have fled to government-held towns and cities. 1: The White Helmets are not recognized by the ICDO and are not members of the ICDO. 2: The White Helmets are not even “concretely” a civil defense organization. 3: The White Helmets are the “wrong” civil defense group. 4: The only civil defense group recognized by the ICDO and the UN is the “official” Syria Civil Defence. Western public perception has been deceived into believing the White Helmets are the only Syrian civil defense group, thus “disappearing” over 4,000 REAL Syria Civil Defence workers who risk their lives on a daily basis to rescue Syrian civilians under attack from the various terrorist factions that have invaded Syria. The NATO and Gulf state White Helmets project is shadow-state construction of the highest calibre. During my August 2016 interviews with the REAL Syria Civil Defence, I was informed that the Nusra Front and associated “moderate rebels” who invaded areas such as east Aleppo, Raqqa, Deir Ezzor and Idlib had massacred members of the REAL Syria Civil Defence and stolen the majority of their equipment in those areas, including fire engines and ambulances. In August 2016, I conducted a short video interview with Dr. Bassem Hayak of the Aleppo Medical Association, which is based in west Aleppo. Dr. Hayak told me that his family, trapped in east Aleppo, had never seen the White Helmets, adding that UN agencies still operating in east Aleppo, such as the SARC (Syrian Arab Red Crescent), had not encountered the White Helmets either. In December 2016, I was in east Aleppo when the SAA and its allies liberated the area from Nusra Front-dominated terrorist and extremist occupation. I was able to interview SARC volunteers who also denied having ever encountered the White Helmets during their time working in these districts of Aleppo. This testimony was further confirmed by the civilian statements I gathered while in east Aleppo, visiting each district as it was retaken by the SAA. I was told that the White Helmets did not help civilians, that they were a support group for Nusra Front, Ahrar Al Sham and Nour al Din Zinki. Some told me they were thieves, that they would steal from the bodies of the dead. One man told Lizzie Phelan of RT that they killed his infant girl by injecting air into her veins. I was told that no medical treatment was available for civilians during the area’s five-year-long occupation. A number of these Syrian civilian testimonies regarding the White Helmets were compiled into one video. Pierre Le Corf, a French national working as an independent humanitarian volunteer in Aleppo, filmed the main White Helmets center in east Aleppo after the White Helmets had abandoned the civilians they had claimed to protect during the almost five-year-long terrorist occupation. They departed east Aleppo in buses that were also used to evacuate an assortment of armed groups, including Nusra Front. These evacuations took place during December 2016 under the Syrian Government Amnesty and Reconciliation agreement, which permitted safe passage for armed fighters to Idlib. Le Corf’s film shows us that the White Helmet center was integrated into the Nusra Front compound and that this White Helmet center was adorned with a variety of graffiti and flags affirming the White Helmet affiliation to various terrorist groups, but predominantly Nusra Front. On multiple occasions, the White Helmets have been exposed staging rescue scenes for both photo and video, recycling images of children and incidents from the conflict in Syria to support their narrative, as well as editing video in a way that misrepresents the scene in question and even using fake images. The video depicts three naked, lifeless children being treated for chlorine gas inhalation. The youngest child has a hypodermic syringe inserted into his chest and moved around erratically before being withdrawn. It appears as if the child dies on screen. 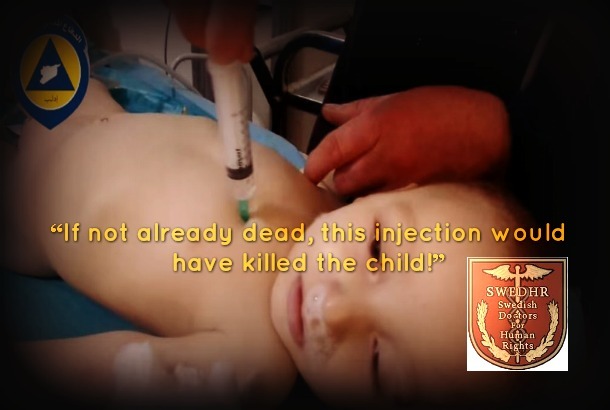 3: SWEDHR concluded that the liquid level in the syringe does not change in the footage — therefore, the child is being injected with the needle for no apparent reason. The implications of these conclusions are horrifying. Did the White Helmets use already dead children as propaganda props? Why has this investigation not been aired by mainstream media? …the amount of dignity that they give to those who lose their lives in Syria also has to be noted” – Joanna Natasegara, Oscar-winning filmmaker responsible for the Netflix documentary on the White Helmets. Screenshot from video showing White Helmets standing on top of Syrian Arab Army soldiers bodies, whose boots have been stolen or removed. The White Helmets have been filmed describing Syrian Arab Army bodies as “trash” and one particular video shows them standing on a pile of SAA soldiers’ bodies whose boots have been removed or stolen. The White Helmets talk about the bodies in pejorative terms, flashing “V” signs as a truck drives off with the White Helmets still atop the decomposing bodies of Syrian soldiers. There are many documented and archived images that show White Helmet operatives carrying arms or posing with arms alongside armed militia groups in Syria, including Nusra Front. 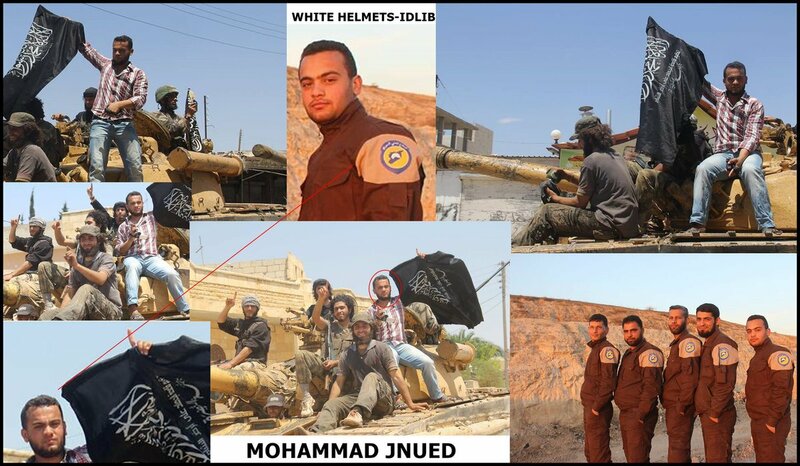 Images taken from the Facebook page of White Helmets operative Mohammad Jnued showing him holding the Nusra Front flag. Yes, a few members of the White Helmets used to be former fighters, but they gave up their guns and now save lives. People change. Just because they did not clear their social media history of pictures and slogans from the time when they took up arms does not mean they are still fighting.” – Interview with James Le Mesurier featured in Middle Ground. However, the number of images available on White Helmets social media accounts tell a different story. Many of the posts are blatant in their allegiance to the extremist factions that work alongside the White Helmets. Certainly, they are worthy of further investigation in the interest of objective reporting on events inside Syria. In March 2016, White Helmets operative Mo’ad Baresh was killed fighting against the Syrian Arab Army in a battle for Khan Touman, southern Aleppo. Baresh was no ordinary White Helmets operative, as can be seen from video footage compiled by investigative journalist Khaled Iskef. Baresh was, in reality, one of the many extremist fighters controlled and dominated by Nusra Front in Aleppo. Rather than a “former fighter,” Baresh was another in a long line of White Helmets who don a white hat to camouflage their crimes against the Syrian people. 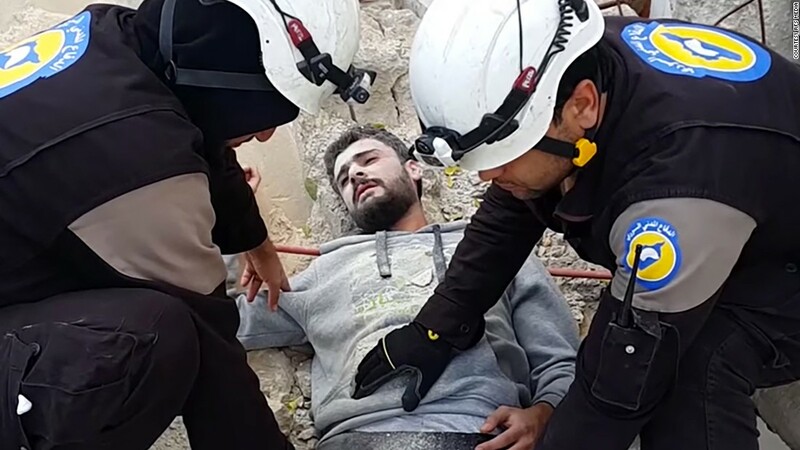 Analysts have observed that the White Helmets make an average of four or five videos per day, depicting their “heroic rescue efforts.” The REAL Syria Civil Defence have evaluated these videos and cast doubt as to whether the White Helmets are true first responders or urban search and rescue experts. They have pinpointed various anomalies, including the use of heavy equipment that is unsuitable for finding bodies in collapsed buildings, as well as the improper treatment of the injured. Many of the group’s paramedic procedures have also been deemed questionable. The White Helmets rarely travel without a sizeable camera team or crew of mobile phone cameramen. The Syria Civil Defence do not, as they are under too much pressure to save lives to prioritize their PR campaign. The following video taken from the White Helmets “collection” is an example of the heavy-handed methods employed by the group when recovering bodies. As I remarked in a previous article, the use of a mechanized digger and sledgehammers in such a fragile environment is inappropriate and life threatening — unless, of course, the White Helmets know in advance exactly where the bodies are located. A recent Ron Paul Liberty Report interview with former UN Chief Weapons Inspector for Iraq Scott Ritter further exposed the parody that is the White Helmets’ experience, when he discussed their role in the alleged chemical weapons attacks in Khan Sheikhoun in April 2017 — alleged attacks that resulted in President Donald Trump launching 59 Tomahawk missiles into Syrian territory. Some would say the White Helmets do indeed deserve an Oscar for their acting skills and video production. In November 2016, a video was released showing the White Helmets apparently participating in the “Mannequin Challenge” Internet video trend. However, the veracity of that claim has been questioned by many who believe this video shows the White Helmets at work in the “studio,” producing more of their propaganda. The White Helmets claim to have saved over 90,000 lives. However, there is no documentation of these lives — no names, no records. With all the logistical and financial support being received by this group, much of it coming directly or indirectly from taxpayer pockets, there should surely be some degree of accountability for their outlandish claims. In summary, this evidence points to the White Helmets being a U.S., U.K. and EU creation and not an independent NGO. It is a multi-million dollar organization funded by governments that are involved and invested in the Syrian conflict. No one can rightly call this a grassroots Syrian organization. There is an existing Syria Civil Defence that is being ignored by Western media. Running parallel to this group, there is a vast fundraising network constructed to collect money that is funneled into the White Helmets in order to replace the authentic Syria Civil Defence in the minds of the Western public. The real Syria Civil Defence is crippled by U.S. and EU sanctions, while the White Helmets have never been affected by these sanctions — their supply chain via Turkey is unbroken. Conservative estimates put White Helmets funding at over $150 million thus far, which is far more than any real humanitarian NGO would ever require in a decade, much less three years. Taxpayers in funding countries have a right to know precisely what and whom their money is funding. The evidence demonstrates that the White Helmets are sectarian — not impartial, as they claim to be. They are in many instances armed — not unarmed, as they claim to be. 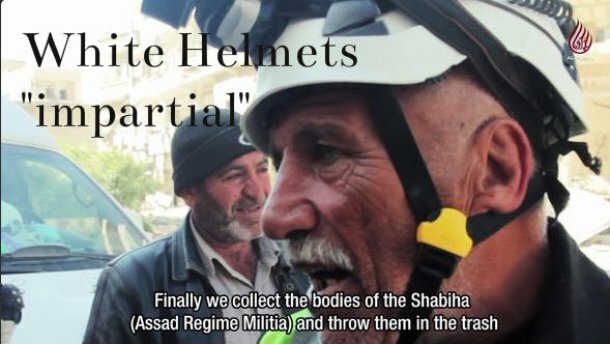 The promotional material produced for the White Helmets, such as the recent Netflix documentary film, is often produced outside of Syria, usually in Turkey, and with field footage supplied only by the White Helmets. Who has verified the authenticity of this footage? The White Helmets, an allegedly impartial and apolitical organization, is effectively campaigning for an escalation of war in Syria. This alone should disqualify the White Helmets from being described as a humanitarian organization. Many of the White Helmets campaigns have been discredited as fiction, and yet they are being used by the U.K./U.S. coalition as justification for continuing economic and diplomatic sanctions that are a collective punishment for the Syrian people. Meanwhile, the U.S. coalition persists with equipping and arming the various militia groups on the ground in Syria, including Nusra Front. This only serves to ensure even more suffering and bloodshed inside Syria and delays the possibility of any real, peaceful resolution. It is incumbent upon us to ensure a full, international enquiry into the White Helmets as a part of any authentic peace process in Syria. Screenshot from White Helmets “Mannequin Challenge” video. Part Two of this series will further expose the White Helmets’ connections to Nusra Front and their participation in terrorist atrocities across Syria, with a particular focus on east Aleppo. The author will bring to light documents and evidence found inside abandoned White Helmets centers across the various districts of east Aleppo and demonstrate that the White Helmets invariably worked next door to al-Qaeda or even shared facilities and buildings with them. She will also delve deeper into the funding streams that the group uses, based on the evidence uncovered during her investigation on the ground in Aleppo. Finally, she will dismantle some of their more iconic propaganda campaigns, shown to be based on lies, designed to facilitate NATO and Gulf state military escalation and increased faux-humanitarian intervention in Syria.